We choose the beach for nearly all our vacations, opting for cool weather, the solitude and salt air over mountain hikes, Mazatlan or the Big Island. It’s not that we don’t like crowds, glitzy resorts or hot weather, it’s mainly that we’re cheap. Also, we can bring our dogs and this is the part that we like best. 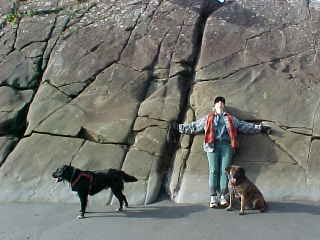 The dogs are so dependably exultant when they hit the sand that we catch ourselves grinning just watching them frolic. Walking the beach feels ancient and grounding. When I get off by myself and reach stride on the expanse of hard packed sand, I often close my eyes and let my sense of balance go where it wants to, the rhythm of the surf to my left and deep gravity of the eroded cliffs to my right pulling me into a zig-zag pattern traceable by the shoe tracks left in my wake. 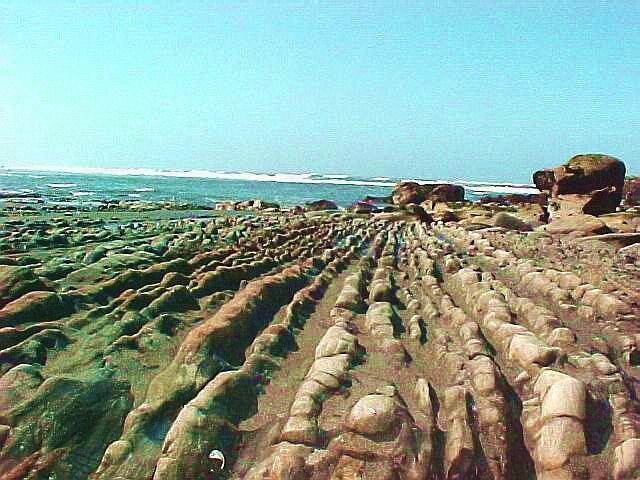 The ancient part of the Olympic National Park Coastal Strip is evident in the odd rock formations that litter the sand. Sandstone lumps jut from the pebbly beach riddled with finger-sized holes that beckon like a bowling ball does for tactile exploration. Huge stratas of tilted shale pushed out of kilter by the collision of tectonic plates can take on a menacing visage in the half-light of dusk. I imagine men coming through the mist from the moss-covered forests hundreds of years ago to see the ocean for the first time. Long before Captain Vancouver, Lewis and Clark or the legions of land grabbers that followed, I think of Indians who came here purely out of survival instinct, living on berries and salmon, braving the wetness during the long dark winters. The shapes of the enormous Sea Stacks at low tide became the stuff of stories designed to keep children in line and men and women awake at night. Pacific Northwest Indians nurtured myths about the land around them here, from stories of a Thunderbird that lived in a cave in the Olympic Mountains, to the two-headed sea serpent ‘Sisiutl’ who attacks and devours people who walk the beach alone. My eyes pop open at this to search for my partner, and I remember the rest of that myth. Sisutl had one head that is male and the other female, one hot, the other cold, as in yin and yang in the form of a serpent. If one attacks you, do not run. The two heads will meet as it lunges, and as the opposing forces come together, you will achieve tremendous spirit power. The old chiefs knew people who gained this power, seeing how enlightened Sisiutl’s near-victims could become. roller coasters,circus clowns or the I.R.S. All along this section of sand between Kalaloch and Rialto Beach are tidal pools that secure a multitude of strange looking creatures. Sea stars clutch at overhanging rock, Sea anenomes, urchins, sculpin and nudibranches cling to what was once bedrock while mollusks, periwinkle snails, gooseneck and acorn barnacles glue themselves everywhere. The sun drops to meet the horizon at sea level in a dull orangy blur and we can smell rain on the way so we turn around and make for the cabin. It rains 200 plus inches a year here and we arrive at the cozy room just as the mist that became a drizzle becomes a drench. Inside there is a Franklin stove and a nice pile of dry wood. We marvel at the good timing and rain avoidance as the flames lick the logs into respectable heat. pummel away at leave the flatter formations of sandstone looking like huge ruffles potato chips. I click onto a shot of my wife leaning against an immense, slanted boulder. Smoothed by wave action into looking softer than it is, with rifts dividing it’s surface into thirds, it’s shape is defined by dark algae in the crevices. She calls this ‘a power rock’ and claims to be able to feel the vibrational energies as they well up from the earth. I learned a long time ago not to question her claims, however bizarre, but I did my own hands-on research there and didn’t feel much beyond a cold, sandy consistency and maybe a bit of loneliness as she walked on without me down the beach. Still, there is no question that this is a powerful place. The disparate elements of wind, earth and water come together here to form an ongoing natural art project, complete with the joy of animal abundance and the tragedy of death by slow erosion, the beauty it creates completing the cycle. Masses of interlaced driftwood bones bleached by salt and sun rim the transition between surf and incline cinching up the grassy-skirted cliff for miles like a tumultous wooden belt. 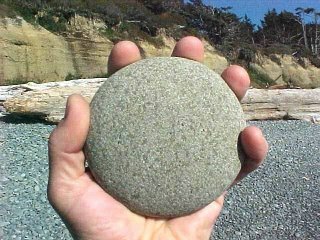 Gray-green rocks from palm-sized to dime-size, rounded to near perfect circles by grinding, sand-laced ocean waves, haphazardly carpet long portions of beach so that they resemble a treasure of stoney coins spilled from a giant’s pocket. A lone bald eagle, enconsced in a high, barkless spar-tree, stoically ignores the harrassment of ravens in a nearly artifically, immobile perusal of the terrain below. Other naturally powerful places exist in other parts of the world and men have historically sought them out. Mt. Haleakala on the island of Maui is said to be the home of Madame Pele, the steppes of Upper Mongolia hold the ghosts of mongol horsemen for all eternity and the Caves of Shanidar in northern Iraq have been found to contain human remains dating from 60,000 BC. 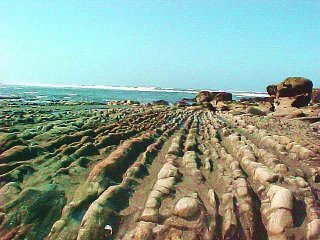 Beyond all of this, what we find when we walk the timeless sands of ocean beaches is the interconnectedness of all things. The feeling that any of us get when we tap into something as simple and primal as moving our bodies across very old ground, across living examples of creation, across time itself.